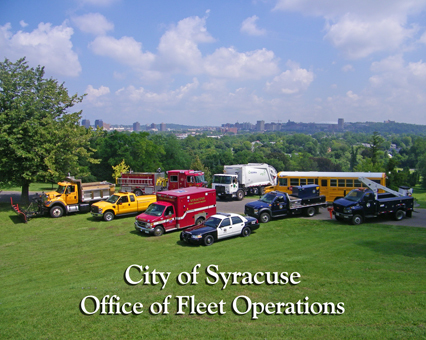 The Office of Fleet Operations is the consolidation of the vehicle maintenance facilities of Fire, Police, Public Works, Water, and the Syracuse City School District. The office assists each facility with daily work assignments, problems and the outsourcing of orders to private vendors. This program is used to complete vehicle work orders, vehicle inventories, parts inventories and personnel databases. The Department is divided into the following areas, Shared Services, Support Services and Towing. Listed below are the Fleet Operations facilities and their locations. City of Syracuse Municipal Vehicles and Equipment are auctioned on a frequent basis through Onondaga County Department of Purchase in cooperation with Auctions International. You can check Auctions International Website and then look up City of Syracuse.